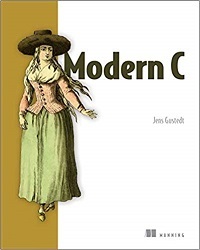 The C programming language has been around for a long time - the canonical reference for it is the book written by its creators, Kernighan and Ritchie . Since then, C has been used in an incredible number of applications. Programs and systems written in C are all around us: in personal computers, phones, cameras, set-top boxes, refrigerators, cars, mainframes, satellites, basically in any modern device that has a programmable interface. In contrast to the ubiquitous presence of C programs and systems, good knowledge of and about C is much more scarce. Even experienced C programmers often appear to be stuck in some degree of self-inflicted ignorance about the modern evolution of the C language. A likely reason for this is that C is seen as an "easy to learn" language, allowing a programmer with little experience to quickly write or copy snippets of code that at least appear to do what it's supposed to. In a way, C fails to motivate its users to climb to higher levels of knowledge. This book is intended to change that general attitude. It is organized in chapters called "Levels" that summarize levels of familiarity with the C language and programming in general. Some features of the language are presented in parts on earlier levels, and elaborated in later ones. The Mirror Site (1) - PDF, Exercises, etc.